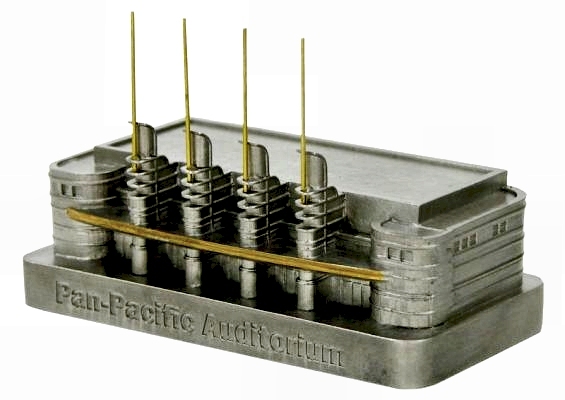 The Pan-Pacific Auditorium was located at 7600 West Beverly Boulevard in Los Angeles and was completed in 1935. This building was designed by Wurdeman and Becket Architects. The Pan-Pacific was destroyed by fire in 1989 and the site is now Pan-Pacific Park with a smaller version of the once famous Auditorium. This pewter replica's base measures 3-3/4 inches long and 1-7/8 inches wide and is finished in new pewter with gold highlights. Just received this in the mail today and it is fantastic! Amazing detail. I want more models.